The first steps are to create a connection – Linked Server . 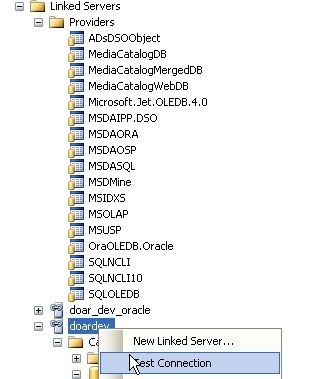 You have to enter your SqlServer and from there run those commands adjusted to your db. Those commands create Linked Server to your Oracle Server and setting the permission of your SqlServer to the level of permissions of the user you use to connect to Oracle Server(remote server). 1)check that you have “allow inprocess” in provider you use . the question is what missing for the proper connectivity and migration . Go back , Right Click on the linked Server “Test Connection” – it should work!